Hi it's Christine here with a couple of cards using Pan Pastels and Versamark. Pan Pastels are an artist grade pastel which you apply with a very soft sponge. For my first card I added the pastel colour to the background (yellow and orange). Once I was happy with the colour I stamped the images using Versamark I then used a ruby red pastel over the Versamark. I used pencils to add a little more colour to the petals and a white acrylic paint marker for the centre of the flowers. the Butterflies were heat embossed in white. Bonjour, c'est Christine ici avec quelques cartes utilisant des Pan Pastels et du Versamark. Les Pan Pastels sont des pastels de qualité artiste que vous appliquez avec une éponge très douce. Pour la première carte, j'ai ajout la couleur pastel à l'arrière-plan (jaune et orange). Une fois satisfaite de la couleur imprimée avec le Versamark, j'ai ensuite utilisé un pastel rouge rubis sur le Versamark. J'ai utilisé des crayons pour ajouter un peu plus de couleur aux pétales et un marqueur acrylique blanc pour le centre des fleurs. Les papillons sont embossés en blanc. For my second card the background was created with distress oxide inks, the flowers were stamped in Versamark and a blue metallic Pan Pastel used to make the image pop. Pour la deuxième carte, l’arrière-plan a été créé avec des encres à base de Distress Oxide, les fleurs ont été étampées au format Versamark et un pan pastel bleu métallique a été utilisé pour faire apparaître l’image. Very nice Christine, I especially like the second card, so soft and delicate. Such a wonderful duo of cards. Love the brightness of the first and the softness of the second. I really love the mix of the flowers, the butterflies, and the bubble pattern in the first one. Two beautiful pan pastel cards Christine. It shows the versatility of the product and the images you've used as one is bold and bright with large beautiful flowers; while the other one is soft and delicate with subtle images. Great work! Always learn so much for you! Wonderful creative cards and thank you for the inspiration and using the pan pastels in different ways x. It looks like pan pastels are something I NEED after seeing these cards. The color is so soft and blends so well. I love them both. WOw! Those backgrounds are fabulous and love the process you used to achieve these. Sadly I had pan pastels for years and finally got rid of them and now I'm regretting it. Love these effects as well as the soft stamping on them. Gorgeous cards! Two more gorgeous cards, Christine! Love the orange and red with the pop of white butterflies! Warm and interesting. 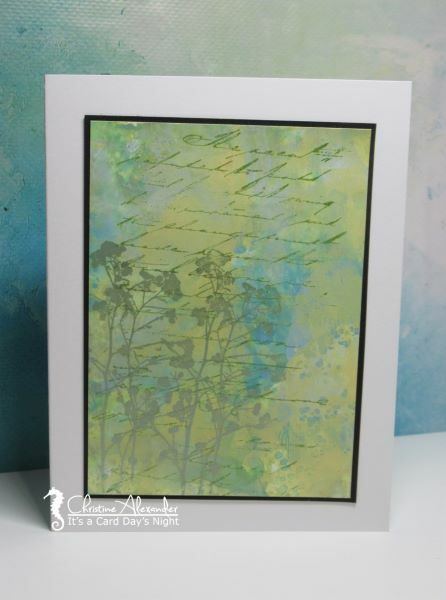 The DOX background is a perfect for showing off the script and wildflowers! Both pan pastel cards are so beautiful, Christine! 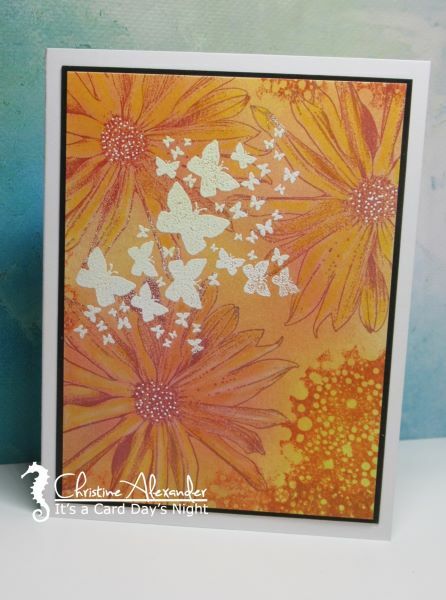 I love that the white butterflies pop against the gorgeous orange and red flowers.The second card has a completely different look - soft, delicate, and dreamy. The script stamping is a wonderful touch!